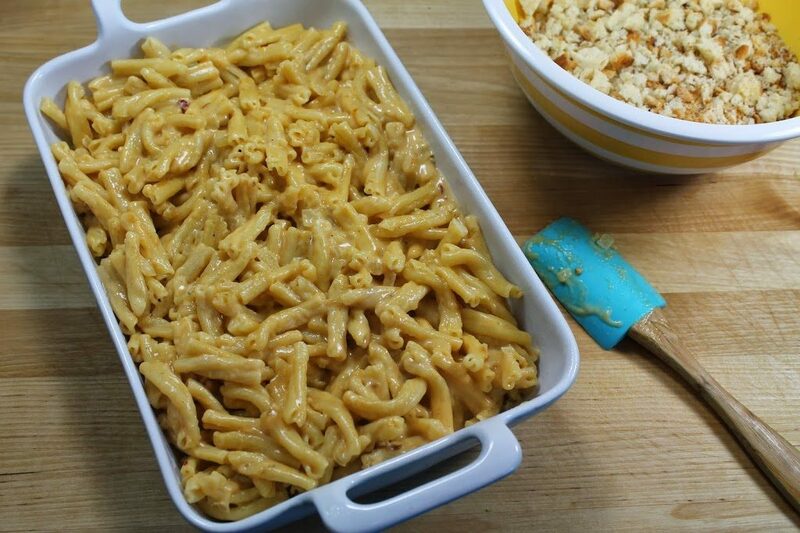 Macaroni and cheese is by far one of our favorite side dishes to make. It is also the kind of recipe you can easily adapt depending on what kind of cheese you have on hand. Back in the day my son loved to get fresh jalapeno cheese curds from the farmers market. So naturally he loves this Spicy Baked Jalapeno Mac and Cheese recipe! My favorite part about adding cheese curds is that they don’t melt completely. This gives your pasta a great cheese pull! American cheese is what gives this recipe it’s melty, creaminess. My best advice is to get your American cheese fresh sliced from the deli counter. It’s a lot better than the stuff that comes individually wrapped! Also take the extra step to grate your cheeses at home. Shredded cheese in the bag as a coating to keep it from sticking in the bag. Those same additives keep it from melting in your cheese sauce. Your cheese sauce will seem thin, but it tightens up in the oven. 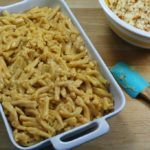 I like to use chicken stock when making the cheese sauce for this Spicy Baked Jalapeno Mac and Cheese recipe, but you could use milk instead. It really is personal preference! I hope you like our Spicy Baked Jalapeno Mac and Cheese as much as my crew does. If you love this cheesy pasta recipe, you can find more like it by checking out my Pasta section! For recipe inspiration delivered to your inbox, subscribe to my newsletter, follow my photography journey on Instagram, and for generally inappropriate humor follow like me on Facebook! A tasty pasta side dish made with squeaky jalapeno cheese curds, American cheese, and freshly grated Monterey Jack cheeses. Preheat oven to 350°F degrees. Butter a large baking dish, set aside. Cook pasta according to the package directions, undercooking by 1-2 minutes. The pasta will continue to cook in the oven. Set aside. Heat a large saucepan or Dutch oven on medium heat. Add extra virgin olive oil, butter, and onions. Sauté for 3-4 minutes until translucent. Add garlic, cook for 1 more minute. Sprinkle in flour. Cook for approximately 1 minute stirring frequently. Slowly whisk in the chicken stock. Stir in half and half along with the spices. Let simmer for 2 minutes. Roughly chop cheese slices. Add to pot along with cheese curds and grated cheese. Stir frequently until melted. Pour cooked pasta in pot. Stir to completely coat. Transfer pasta mixture to greased baking dish. Top with breadcrumbs. Bake 20-25 minutes until browned and bubbly. Let rest 5 minutes before serving. Tip - Take the extra step to grate cheeses at home. Shredded cheese in the bag as a coating to keep it from sticking. Those same additives keep it from melting completely.